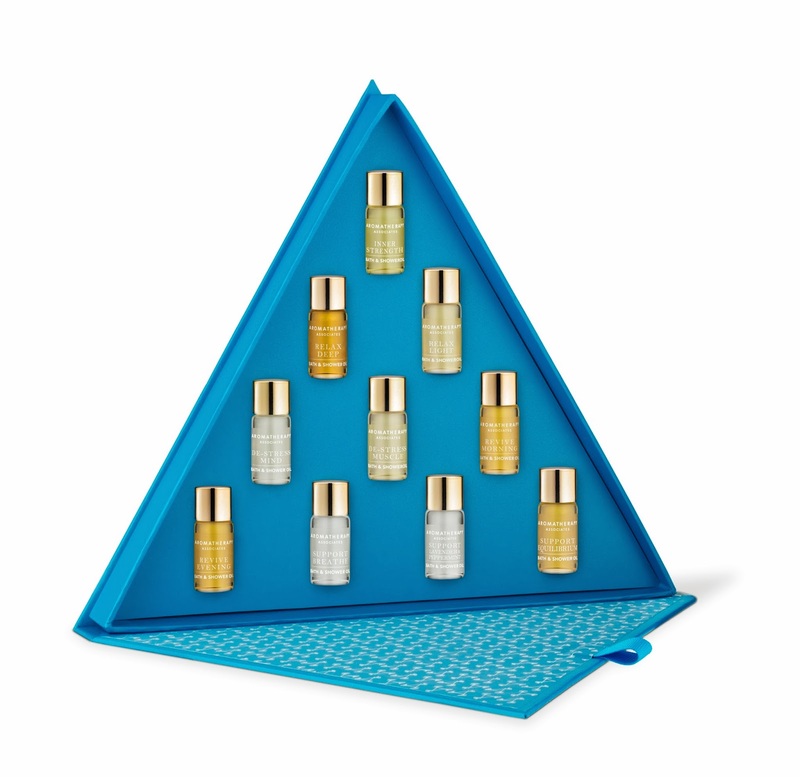 If you're buying for a beauty junkie this year and are unsure where to start, look no further than the Aromatherapy Associates Festive Bath & Shower Collection, the ideal gift and one of my top picks for Christmas 2013. It's no secret that Aromatherapy Associates is one of my favourite beauty brands and in particular, their bath & shower oils have earned can't-live-without status thanks to their truly effective aromatherapeutic benefits. I've previously reviewed the Aromatherapy Associates De-Stress Muscle Bath & Shower Oil (click here) but I've tried a number of the oils and can honestly say that the quality is consistently exceptional and I'm yet to try something from the brand that leaves me disappointed. Containing ten x 3ml glass bottles of oil, the Festive Collection is presented in a striking cobalt blue triangle box to resemble a Christmas tree. Anyone unwrapping this may initially think they're receiving an interestingly shaped box of chocolates but the Aromatherapy Associates Festive Collection is far more indulgent and will most likely last longer than to the end of the Boxing Day movie too! Revive Morning- wonderfully awakening with a blend of pink grapefruit, rosemary and juniper berry that's always handy the "morning after the night before"- the recipient will thank you on 1st January! The oils are packed full with pure essential oils so a little goes a long way and I'd say that each 3ml bottle contains sufficient product for two uses. The Festive Bath and Shower Collection would make the perfect gift for someone who's already a fan of the range, whilst also being a brilliant introduction to someone enjoys taking some me-time to pamper and indulge. The oils can be used as traditional bath oils or applied directly to the body before a shower (this is my personal favourite way to use them) so there's no need to try and guess if your gift recipient takes baths or showers. Aromatherapy Associates Festive Bath and Shower Collection costs £35 and in my opinion, is worth every single penny. Highly recommended. Honest to get essential oil! Its massages are known to soothe and heal the skin. It nourishes and hydrates dull, dry skin. It also improves the condition of oily skin. This promotes hair growth and improves the condition of the hair.